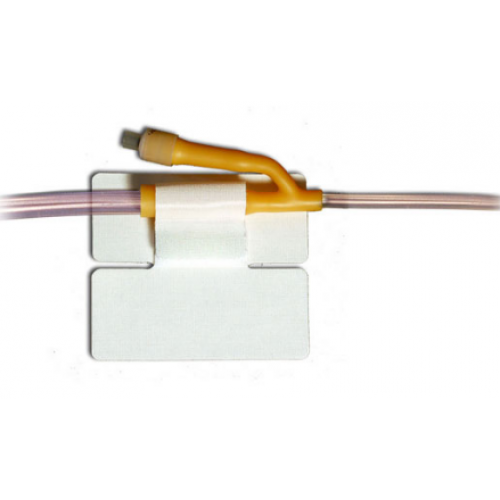 Patient care and comfort is drastically enhanced by using the original CATH-SECURE catheter tube holder by M.C. Johnson. It's applied by removing the adhesive side and affixing it to the top of the thigh of the patient to secure a catheter in place. The Cath-Secure has a built-in single tab which comes in two sizes (5445-2 and 5445-3) to accommodate for varying tube sizes. 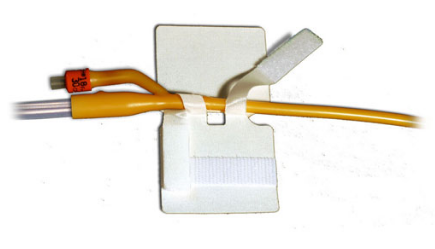 The tab wraps around the catheter to form a lumen to anchor the Foley Catheter. The Cath-Secure tube holder gives the patient the ability to move around freely without uncomfortable tugging or worry about the catheter being pulled out. This increases nursing productivity not having to replace catheters. The alcohol-soluble adhesive side of the Cath-Secure is hypoallergenic to be gentle to the skin. It can hold the catheter for up to a week without altering the skin's integrity. 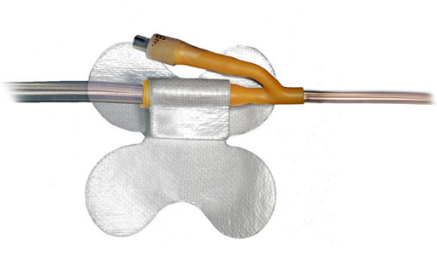 The tube holder is multi-purpose and is also used to secure subclavian line ports, ekg lead wires or a dialysis tubing. The CATH-SECURE DUAL TAB tube holder is another great product by M.C. Johnson to anchor tubing. It is applied like the original Cath-Secure but features dual tabs with a press-on hook-and-loop fastening system. The tabs are flexible and longer to hold varying tube sizes that can be adjusted as needed without the need for re-taping. This provides repeated access to tubing without restricting the flow. The Cath-secure Dual Tab (5445-4) is also used as a multi-purpose tube holder for peritoneal dialysis exit site tubing, leg bag tubing, condom catheters and prostatectomy tubes. The Cath-Secure Plus (5445-6) also eliminates the need for re-taping with one tab and a butterfly base design. To create enough slack, patient needs to fully extend hip to prevent undue traction on catheter. Clean skin and completely dry before application. Peal away adhesive side and press against skin. 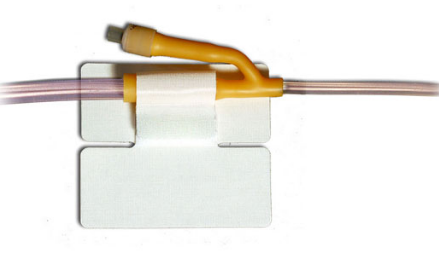 Place catheter on top of Cath-Secure and wrap tab around tube to secure. Remove if Skin shows signs of irritation. We are able to ship to other countries. Simply use our "international checkout" button from the cart screen and select the country you wish to have the item delivered to. Shipping costs will show afterward. Fast shipping, fair pricing, good customer service! The diameter tubing allowed by this item wasn't larger enough to easily secure a commonly used size 16 French cath. By day two it was ripping apart and had to be removed. So even though the Bard Stat-Lock cost substantially more, you get what you pay for. Bard's is large enough to easily lock & unlock tubing as many times as may be needed, it stays stuck until you remove it & the adhesive doesn't irritate my sensitive skin. A great experience, fast response and received it in just a couple of days! Product was exactly as ordered and expected. Thank you! product works better than any other I've tried. delivery is also very prompt. Work great keeping catheter in place.